Genome scale molecular datasets are often highly structured, with many correlated measurements. This general phenomenon can be related to the underlying data generating process. In assays of mixed cell populations, such as blood, variation in cell-type proportion induces a complex correlation structure at the gene-level. Likewise, groups of genes can be co-regulated/co-expressed through shared transcription factors and signaling pathways. Many applications of gene expression analysis rely on their ability to reflect these unobserved biological processes in order to draw mechanistic conclusions. On the other hand, correlated patterns of expression may also reflect nuisance factors, such as batch effects, which interfere with correct biological interpretation. The choice of analysis method is heavily dependent on which of these factors (nuisance or interesting biological) is believed to account for more variation and the optimal variance analysis strategy remains an open question. In this study we describe a method to infer a biologically grounded data generating model that provides estimates of underlying biological processes, including explicitly identified pathway-level and cell-type proportion effects. Specifically, we formulate a new matrix decomposition framework, PLIER (Pathway-level Information ExtractoR), that explicitly incorporates prior biological knowledge. Using simulations, we demonstrate the superiority of our method in recovering the true data generating model. Using real data, we show that our approach is able to recover interpretable biological variables, reproduce previous findings in a simplified framework, distinguish biological and technical variation, and provide additional biological insight. The PLIER method and auxiliary functions and data are compiled in the PLIER R package available at https://github.com/wgmao/PLIER. One salient feature of high dimensional molecular data is the presence of groups of correlated measurements, i.e. data structure. In gene expression datasets correlation among genes may be the result of coordinated transcriptional regulation. In such cases, understanding the underlying pathway-level effects can improve statistical power and interpretation. On the other hand, a variety of technical factors, often referred to as “batch effects”, are also reflected in the data structure (see Leek et al. for review). Thus, common variation in gene expression can be a nuisance that interferes with differential expression analysis but may also represent important biological processes. Methods to address these sources of variation have to balance decreasing noise against removing biological signals. To take an illustrative example we consider the problem of transcriptional profiling in human blood, which is a complex and highly variable mixture of at minimum 20 transcriptionally unique cell-types [Novershtern et al., 2011]. In a typical blood dataset the first few principal components (PCs) produced by Principal Component Analysis (PCA) capture most cell-type composition and technical variation. However, cell-type composition heterogeneity in blood can itself be of interest, complicating the decisions regarding which variation should be removed. For example, in a recent study [Battle et al., 2014] of blood eQTLs, two different normalizations, with different numbers of latent components, were applied to optimize cis and trans eQTL discovery. This was motivated by the observation that biological variation in the dataset, such as cell-type proportion variation, yields significant trans-eQTL effects. However, these same effects become a nui-sance variable when assessing cis-eQTLs. Ideally, it should be possible to cleanly separate variation that is due to technical factors from that which has a biological origin, while also attributing the latter to specific biological processes. For example, in a recent paper we proposed a strategy that extracts latent variables that have a one-to-one correspondence to variation in specific cell-types. This allows for composition variation to first be analyzed directly and then statistically removed to identify transcriptionally mediated effects, thus retaining all biologically relevant signals. However, this kind of analysis is difficult to automate and our approach relied heavily on some intuition about which cell-types are detectable in specific datasets, which depends critically on the size of the dataset, sample preparation, and biological perturbation. The problem of finding the correct data generating model has received considerable attention. The widely recognized drawback of PCA is that it produces necessarily orthogonal components that are linear combinations of all original variables. Thus the PCs do not in general align with the true latent variables that drive common variation. One approach is to partition the variation into biological and technical in a supervised fashion, that is based on additional information about the samples, such as the contrast of interest, or known technical factors (see Leek and Storey , Stegle et al. , Listgarten et al. , Kang et al. and Mostafavi et al. , which formulates a general framework for the variation partition approach). However, while these approaches can dramatically improve statistical power by removing technical variation, they do not provide a generative model for remaining biological variation and heavily depend on the availability and quality of the auxiliary sample data. An alternative approach is to seek an entirely unsupervised model by imposing additional constraints on the matrix decomposition problem in order to identify biologically meaningful variance components [Ma-honey et al., 2009, Srebro, 2004, Gillis, 2014] For example, non-negative matrix factorization (NMF) is a popular choice for gene expression analysis [Brunet et al., 2004, Wang et al., 2013, Gillis, 2014]. Another approach is to introduce sparsity constraints so that only some genes have non-zero loadings (often referred to as sparse PCA) [Zou et al., 2006 Witten et al., 2009]. By lifting the highly restrictive orthogonality requirement and imposing biologically motivated structure (such as sparsity or positivity in the gene loadings) these methods will often naturally groups biologically related genes together producing latent components that align well with known biological factors (such as disease subtype) However, as there is no explicit requirement for the genes associated with each component be biologically related, this outcome is not in general guaranteed. Importantly, while methods such as NMF and sparse PCA are indeed automated unsupervised approaches (that attempt to fine a data generating model without any expert knowledge about the dataset) they are also completely general and can be applied to any high dimensional dataset. On the other hand an approach specifically designed for gene expression does not have to be completely agnostic; it can incorporate information about gene identities as long as this information is generic and not dataset specific. In this work, we formulate a alternative matrix decomposition method that explicitly relates the data structure to prior information in the form of pathways and biolog ically related genesets representing biological pathways (e.g. Kanehisa et al. ), sets of tissue-or cell-type specific markers (e.g. [Abbas et al., 2009]), and coordinated transcriptional responses observed in genome wide experiments (e.g. [Subramanian et al., 2005]). Besides the matrix decomposition, our method returns information that indicates if and how each variance component is associated with the prior information, thus providing an additional dimension of biological interpretability without any further analysis. Using simulations and real data we demonstrate that our approach can effectively use prior information to achieve superior performance at recovering the data generating model and providing biological insight. Our method is computationally efficient, running in just a few minutes on large clinical datasets, is robust to technical noise, and is readily applicable to other high-dimensional datasets. subject to rank(Z) = k, rank(B) = k.
Since gene expression measurements are highly correlated, it is reasonable to expect that the data Y can be efficiently represented in this low dimensional space. Without imposing additional constraints on Z and B, an optimal solution can be obtained from the singular value decomposition (SVD) of Y. In an SVD based decomposition rows of B are referred to as principle components (PCs). Since PCs are necessarily orthogonal, which we do not require, we will use the term latent variables (LVs). In order to improve the interpretability of the low dimensional representation, we impose additional constraints on the matrix Z. Our aim is to encourage the loadings (columns of Z) to align as much as possible with existing prior knowledge. In the most general case such prior knowledge can be expressed as a series of genesets representing biological pathways, sets of tissue or cell-type specific markers, and coordinated transcriptional responses observed in genome wide experiments. Given n genes and m genesets we represent the prior knowledge as a matrix C ∈ 0,1n×m, so that Cij = 1 indicates that gene i is part of the jth geneset. subject to U > 0, Z > 0. The first term of the optimization is the same and minimizes the overall reconstruction error. The second term specifies that Z should be “close to” sparse combinations of genesets represented by C and the third terms introduce an L2 penalty on B while the fourth term is an L1 penalty on U (applied column-wise) which ensures that only a small number of genesets represent each LV. The parameter λ1 keeps a balance between the proportion of prior knowledge we include and the degree to which we reconstruct the gene expression profile. We also restrict U and Z to be positive, which enforces that genes belonging to a single geneset are positively correlated with each other and the loadings are positively correlated with the prior information. We solve the optimization problem by using block coordinate minimization, which iteratively minimizes the error on Z, U, and B. The complete method starts by initializing Z and B from the SVD decomposition and repeats the following steps until B converges. The stopping criterion is defined as a relative change in B < 5 × 10−6, or a leveling off in the decrease of the relative change in B. While there are no convergence guarantees, in practice this algorithm converges in under a few hundred iterations. is always minimized when λ1 = 0. However, based on extensive testing with simulations and real data we can set several default parameters that perform well in a range of situations. For example, we find that k should be set to the number of statistically significant PCs. We provide a function num.pc in our package that determines the correct k based on permutation following the approach proposed in [Leek et al., 2007]. A good choice for λ1 and λ2 can be derived from the observation that if we consider the SVD decomposition of Y as UDVt we should have that Z ≈ UD1/2 and B ≈ D1/2VT. Therefore the diagonal elements of ZTZ and BBT are well approximated by D which thus gives the correct range for the relevant constants. By default we set λ2 = dk and λ1 = dk/2 with the factor of 2 coming from the positivity thresholding on Z. It is also possible to optimize λ1 along with λ2 around its default value relative to some external validation source. For example, we can check how well the LVs recovered in B correlate with an independent dataset such as clinical variables, genotype, or another set of molecular measurements. at the first iteration and set λ3 to the median of the maximum values taken columnwise. This approach is motivated by the observation that the lasso problems can be solved by iteratively thresholding ridge regression coefficients. In our experiments with real data this approach indeed resulted in approximately half of the latent variables being associated with prior information. We use these heuristics for all the analysis in the manuscript and set them as the default behavior for our method. It is natural to ask to what extent the nonzero coefficients of U represent non-random associations between loadings (columns of Z) and prior information. In order to quantify this we design a pseudo cross validation procedure that proceeds as follows: we create a new loadings matrix Z' that represents a 4/5 of the genes and recompute new latent variables B'. We then use B' to compute the loadings for the held-out 1/5 of the genes. After completing this for the entire set of genes we can compute the AUC (and the p-value) for each non-zero element of U. While it is also possible to perform true cross validation by running PLIER on a subsets of the raw data this has a significant computational cost and we find that the pseudo cross validation procedure is in good agreement with the true cross validation results. Pseudo cross validation results are provided by default in the output. There are several methods that can take prior information about genesets into account in order to a biologically meaningful low dimensional representation. Examples, include Bayesian Factor Analysis [Bunte et al., 2016] that extracts pathway-level latent variables and our previously proposed method CellCODE [Chikina et al., 2015] that estimates cell proportion variation from cell-type marker genesets. However, these methods require that the genesets be specified a priori and that gene genes can be partitioned into these sets (though some overlap is allowed). In contrast, in our method the pathways themselves are subject to optimization and our method is designed to effectively choose just a few relevant genesets from thousands of available ones. As our goal is to force gene loading to be represented by biologically coherent gene-sets it is natural to seek a solution based on group lasso regularization, which can perform variable selection at the group level. However, given that the biological genesets are highly redundant and overlapping, group lasso, which requires non-overlapping groups, is unsuitable. While it is possible to define more complex norms that accommodate group overlaps these have drawbacks. For example, a related method termed structured sparse PCA [Jenatton et al., 2009] has been developed for image analysis. This method implements a direct optimization of the column support, but can only constrain the support to be the complement of a union of predefined groups, which corresponds to rectangle-bounded regions for images, but is not interpretable for genesets. Another related method that considers biological gene sets explicitly is the Overlap Group Lasso which employs an alternative norm that enforces the biologically desirable union-of-groups support [Obozinski et al., 2011]. However, the implementation is computationally expensive and in its current form only applies to regression without being readily adaptable to matrix decomposition. The Depression Genen Networks (DGN) dataset is not available for public release but can be requested from National Institute of Mental Health (NIMH) following instructions in the original publication [Mostafavi et al., 2014]. The NIMH database contains several normalized versions of this data and for our study we used “trans” normalized data as described in [Battle et al., 2014]. The generic blood cell-type marker dataset was derived from the IRIS (Immune Response In Silico) [Abbas et al., 2009] and DMAP (Differentiation Map) datasets [Novershtern et al., 2011] datasets. Many canonical marker genes (such as CD19, CD3E, CD8A) have a multimodal distribution with on high expressor group and one or more low/medium expressor ones. The highest expression group typically does not overlap with lower expression distributions and we base our marker selection metric on this observation. Genes were considered to be markers if they could be partitioned into high and medium/low expression so that the difference between minimum and maximum values respectively (the gap between these distributions) exceeds a threshold (we used 2 for IRIS and 0.7 for DMAP). This procedure results in highly overlapping sets of markers for related cell-types however our method is flexible and can easily handle redundancy. We also included cell-type markers from a recent publication Newman et al. which covers fewer cell-types but with highly optimized marker sets. The complete prior information dataset used for DGN analysis includes cell-type markers, “canonical” pathways from mSigDB, and a set of transcriptional signatures relevant to immune signaling described in [Filiano et al., 2016]. The entire prior information dataset with 1513 pathways is included in the PLIER package. Since in a real dataset the true data generating model is unknown and is likely more complex than what can be captured with a dimensionality reducing matrix decomposition, we use a simulation to evaluate the operating characteristics of our method. We hypothesize that our method is able to more accurately recover the “correct” LVs by rotating the matrix decomposition to align with prior knowledge. We simulate data with 5000 genes, 300 samples, and 30 latent variable according to the NMF model. With both Z and B > 0. B is drawn from Beta distribution and each column sums to one by design. The columns of Z are drawn from Gamma distribution Γ(5,1). The matrix E ∈ N (0,1) represents random noise. We also generate a prior knowledge matrix C. For each column of Z, we randomly pick up a threshold value on the percentage of genes which belong to a hypothetical prior knowledge geneset. The threshold value varies from 0.01 to 0.1 with a step size 0.01, which is in consistent with that of real biological gene-sets. With the threshold value, we select the corresponding fraction of genes which come with top values in the column of Z to construct the prior knowledge geneset. Also we generate additional uninformative gene-sets by randomly picking genes. For the purpose of applying PLIER and SPC the final data is z-scored. Our basic evaluation strategy is based on computing the maximal correlations between simulated and recovered latent variables, for the purpose of comparisons with other methods we use the absolute value so as to allow factors with reversed sign. Figure 1 depicts the results of multiple simulation runs process with four decomposition methods: PLIER, PLIER with no prior information (which can be accomplished by setting λ3 to a high value), NMF[Brunet et al., 2004] and SPC [Witten et al., 2009]. NMF is a popular decomposition method that is free of hyperparameters (though different matrix norms can be used) however it requires positive data as input. SPC is another popular method that can enforce sparsity and positivity, it has one hyperparameter that we set by crossvalidation as described in the original paper [Witten et al., 2009]. Among these methods only PLIER is able to reliably produce high correlations with the simulated latent variables and only when using prior information. Importantly, we emphasize that the simulation is not based on a PLIER model where we assume that loadings of genes in the pathway and outside the pathway differ by a constant factor but is rather based on the NMF model. Nevertheless the PLIER approach is effective even in the case where the model design differs from the underlying assumptions. We also investigate how adding noise to the prior information affects performance, hypothesizing that as more irrelevant geneset are included in our prior knowledge matrix C, the advantage of using prior information will be reduced. Repeating the experiment above with varying sets of non-informative pathways we find that the performance indeed drops off as the total number of pathways is increased to 10,000 though even at that level of prior information noise PLIER outperforms other methods (Figure 2). Data is simulated according to the NMF model (see text for details). 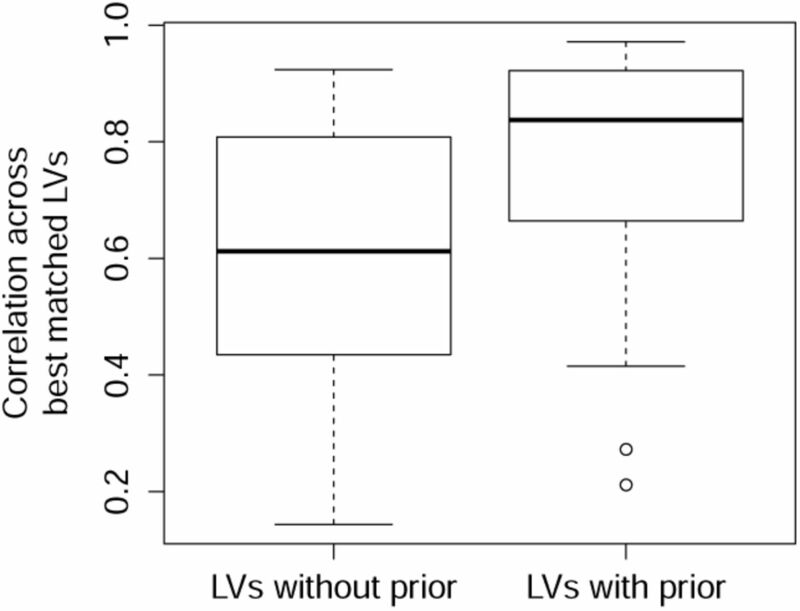 Boxplots of the correlation between simulated LVs and those recovered by various decomposition methods. We compare PLIER against two other methods, NMF [Brunet et al., 2004] and SPC [Witten et al., 2009], as well as PLIER run without using any prior information. In this simulation we provide PLIER with 1000 pathways of which only 30 are correct and vary the size of the prior information pathways provided to PLIER. We find that the best performance is achieved by PLIER specifically when prior information is used with a notable improvement when prior information pathways are larger. To demonstrate the utility of our approach on real data we apply it to the Depression Gene Network (DGN) dataset which consists of 922 whole blood gene expression profiles quantified by RNAseq. One of the goals of the DGN study was to identify gene expression quantitative trait loci (eQTLs). Two groups of eQTLs are typically distinguished: locally acting cis-eQTLs that affect a nearby gene, and trans-eQTLs that affect gene located far from the polymorphism, possibly on a different chromosome. By definition cis-eQTLs affect only a few genes, typically just one, by altering a nearby regulatory sequence while trans-eQTLs may be mediated at the pathway-level. The basic model for such pathway-level effects is that a locally acting cis-eQTL alters the expression for a gene with a regulatory role (such as a transcription factor) which in turn alters the expression of downstream targets, giving rise to several trans-eQTLS. Empirically, many SNPs that affect gene expression in trans affect multiple genes and in many cases a single cis effect, which presumably affects the upstream regulatory factor, can also be found. The converse is not true, however: most cis-eQTLs do not give rise to trans-eQTLs and indeed trans-eQTLs are orders of magnitude less frequent. Blood datasets are particularly challenging as blood composition varies dramatically across individuals and the composition effect can be considered a nuisance or an interesting-biological variables depending on the question asked. Some cell-type variation has a genetic basis which may manifest as trans-eQTLs of cell-type specific genes but the same variation becomes a nuisance variable when evaluating cis-eQTLs. The initial analysis of this datasets [Battle et al., 2014] in fact applied two different normalizations, with different numbers of latent components, in order to maximize cis and trans-eQTLs discovery. While a dimensionality reducing decomposition cannot capture cis-eQTLs it can in principle be used to improve the discovery of pathway-level trans-eQTLs if it succeeds at effectively isolating specific pathway-level effects. In the context of a PLIER decomposition we hypothesize that it is possible to identify trans-eQTLs by testing the relationship between genotype and PLIER latent variables. 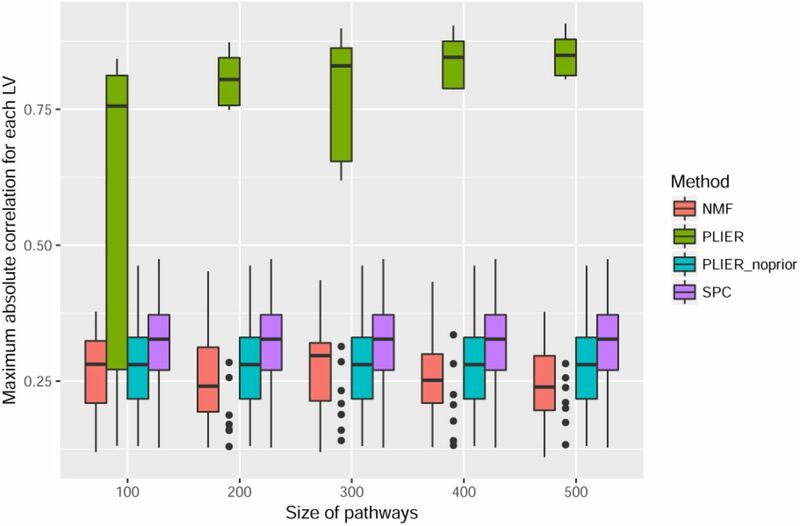 In essence, we simply define a new quantitative trait, instead of using the expression of single genes directly we use the estimated pathway-level effect. We apply PLIER decomposition to the DGN dataset using a set of prior information genesets that includes cell-type markers, “canonical” pathways from mSigDB, and a set of transcriptional signatures relevant to immune signaling described in [Filiano et al., 2016] (see Methods). We produce a 108 dimensional decomposition (see Methods for choosing the decomposition dimension) of which 62 used some prior information. 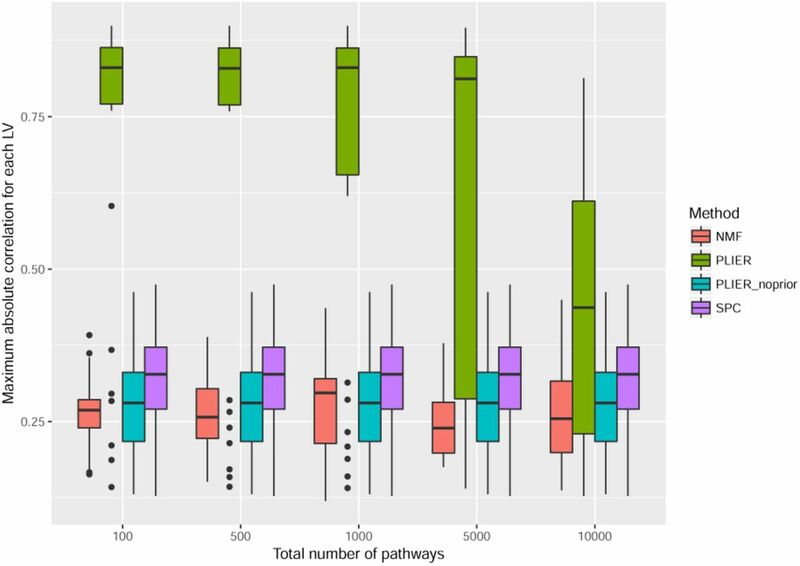 Overall 163 pathways out of 1513 were associated with some LV. Using these decomposition results we observe that indeed many LVs have a significant association with genotype. For those LVs that have a genotype association and also a high confidence pathway association we visualize the corresponding entries in the decomposition matrix U (which specify how the LVs and prior information genesets are related) in Figure 3. In fact, we find that if LVs are used directly as quantitative traits we can greatly increase the frequency of eQTLs that pass the significance threshold (see Table 1). We note that our approach to multiple hypothesis testing is to apply Bonefr-roni correction to each quantitative trait, the same approach used in the original study, and therefore the “success rates” of gene-level and pathway-level eQTLs are directly comparable since the correction does not depended on the number of traits. Top A subset of the prior information coefficient matrix U computed from the DGN dataset. We focus on the latent variables that both had a significant eQTL association and a prior information geneset association with an AUC of 0.75 (see Methods for cross validation approach). Bottom A new significant eQTL that affects the interferon gamma pathway extracted as latent variable LV44. The trans-eQTL “success rate” (defined as the number of eQTLs found significant at an adjusted p-value of 0.05 multiplied by the number of SNPs (651,075)) among different sets of quantitative traits. We consider single gene expression, PLIER latent variables, and a set of latent variables restricted to those that used some prior information. Besides improving the rate of eQTL discovery the PLIER decomposition can be used to infer the biological nature of the latent variable which in many cases leads to improved interpretation. For example we can deduce the that the one SNP that yields the largest number of significant trans-eQTLs in a gene-level analysis is in-fact associated with a single latent variable, that we infer to represent megakaryocyte/platelet lineage cell-type variation (megakaryocytes are the precursors to platelets). The SNP in question, rs1354034, has been previously associated with platelet volume [Gieger et al., 2011]. We also detect several new associations that were not found in the gene-level analysis. One example of particular interest is a significant association between rs3184504 and an Interferon gamma transcriptional signature. The genes with the highest loadings for this latent variable include canonical interferon-gamma regulated genes (GBP1, STAT1, and TAP1 are among the top 10). This associated SNP is a missense variant in SH2B3 which is a known regulator of the Interferon-gamma pathway [Mori et al., 2014]. While recent genome-wide association studies have revealed a link between polymorphism in this gene and autoimmune diseases, including type 1 diabetes and celiac disease [Hunt et al., 2008, Smyth et al., 2008], to our knowledge a direct link to interferon gamma in human blood is a novel finding. A key motivation for PLIER is to tease apart technical and biological variation and the hypothesis is that those LVs that use prior information are indeed of biological origin. If that is the case we expect that PLIER results are relatively insensitive to normalization for technical factors and we test this hypothesis by applying PLIER to differently normalized data. In the preceding section we had used a dataset that was normalized for 20 technical variables which reflected information about data collection and RNAseq quality control. We can also apply PLIER to the “naive-normalized” version of data represented by logged counts normalized by quantile normalization. Obtaining two different decompositions we find that many LVs are indeed in one-to-one correspondence and that these are biased towards LVs that made use of prior information (Figure 5). When the matching LVs use prior information we find that the corresponding genesets are likewise either the same or closely related (Figure 4). 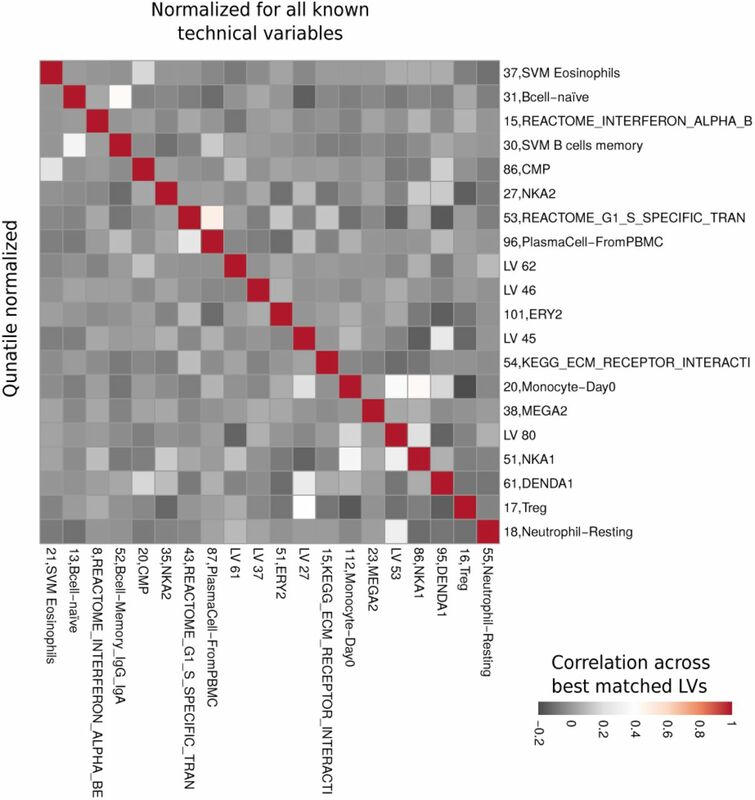 Heatmap of the correlations among LVs from decompositions performed on two different versions of the same data, one normalized for all technical variables and another normalized with quantile normalization. The heatmap shows all pairwise correlations for the top 20 best matched LVs named with their corresponding prior information (if any). Note that the prior information used is almost identical across the two decompositions. Correlation distributions across all best matched pairs of LVs. LVs that use prior information are more robust to normalization procedure as they are more consistent across differently normalized datasets. We present a new method Pathway-level Information ExtractoR, PLIER, which incorporates prior information into matrix decomposition of molecular data, yielding a biologically grounded data model. The method can improve the interpretability of gene expression datasets by providing a correspondence between data structure and biologically coherent gene groups. Evaluating the method on real data we show that it is able to find biological latent variables, reproduce previous findings by recasting trans-eQTLs in a latent variable framework and provide credible novel predictions. Alexander R Abbas et al. 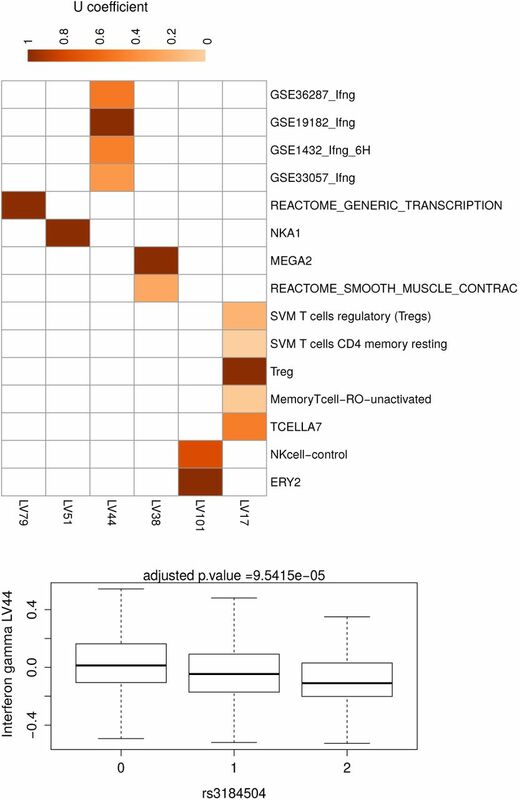 Deconvolution of blood microarray data identifies cellular activation patterns in systemic lupus erythematosus. PLoS One, 4(7): e6098, 2009. doi: 10.1371/journal.pone.0006098. URL http://dx.doi.org/10.1371/journal.pone.0006098. Alexis Battle et al. Characterizing the genetic basis of transcriptome diversity through rna-sequencing of 922 individuals. Genome Res, 24(1): 14–24, Jan 2014. doi: 10.1101/gr.155192.113. URL http://dx.doi.org/10.1101/gr.155192.113. Jean-Philippe Brunet et al. Metagenes and molecular pattern discovery using matrix factorization. Proc Natl Acad Sci USA, 101(12): 4164–4169, Mar 2004. doi: 10.1073/pnas.0308531101. URL http://dx.doi.org/10.1073/pnas.0308531101. Kerstin Bunte, Eemeli Leppäaho, Inka Saarinen, and Samuel Kaski. Sparse group factor analysis for biclustering of multiple data sources. Bioinformatics, 32(16): 2457–2463, 2016. Maria Chikina, Elena Zaslavsky, and Stuart C Sealfon. Cellcode: a robust latent variable approach to differential expression analysis for heterogeneous cell populations. Bioinformatics, page btv015, 2015. Anthony J Filiano, Yang Xu, Nicholas J Tustison, Rachel L Marsh, Wendy Baker, Igor Smirnov, Christopher C Overall, Sachin P Gadani, Stephen D Turner, Zhiping Weng, et al. Unexpected role of interferon-γ in regulating neuronal connectivity and social behaviour. Nature, 535(7612): 425–429, 2016. Christian Gieger, Aparna Radhakrishnan, Ana Cvejic, Weihong Tang, Eleonora Porcu, Giorgio Pistis, Jovana Serbanovic-Canic, Ulrich Elling, Alison H Goodall, Yann Labrune, et al. New gene functions in megakaryopoiesis and platelet formation. Nature, 480(7376): 201–208, 2011. Nicolas Gillis. The why and how of nonnegative matrix factorization. Regularization, Optimization, Kernels, and Support Vector Machines, 12: 257, 2014. Karen A Hunt, Alexandra Zhernakova, Graham Turner, Graham AR Heap, Lude Franke, Marcel Bruinenberg, Jihane Romanos, Lotte C Dinesen, Anthony W Ryan, Davinder Panesar, et al. Newly identified genetic risk variants for celiac disease related to the immune response. Nature genetics, 40(4): 395–402, 2008. Rodolphe Jenatton et al. Structured sparse principal component analysis. arXiv preprint arXiv:0909.1440, 2009. Minoru Kanehisa, Yoko Sato, Masayuki Kawashima, Miho Fu-rumichi, and Mao Tanabe. Kegg as a reference resource for gene and protein annotation. Nucleic Acids Res, 44(D1): D457–D462, Jan 2016. doi: 10.1093/nar/gkv1070. URL http://dx.doi.org/10.1093/nar/gkv1070. Hyun Min Kang, Chun Ye, and Eleazar Eskin. Accurate discovery of expression quantitative trait loci under confounding from spurious and genuine regulatory hotspots. Genetics, 180(4): 1909–1925, Dec 2008. doi: 10.1534/genetics.108.094201. URL http://dx.doi.org/10.1534/genetics.108.094201. Jeffrey T Leek and John D Storey. Capturing heterogeneity in gene expression studies by surrogate variable analysis. PLoS Genet, 3(9): 1724–1735, Sep 2007. doi: 10.1371/journal.pgen.0030161. URL http://dx.doi.org/10.1371/journal.pgen.0030161. Jeffrey T. Leek, Robert B. Scharpf, Héctor Corrada Bravo, David Simcha, Benjamin Langmead, W Evan Johnson, Donald Geman, Keith Baggerly, and Rafael A. Irizarry. Tackling the widespread and critical impact of batch effects in high-throughput data. Nat Rev Genet, 11(10): 733–739, Oct 2010. doi: 10.1038/nrg2825. URL http://dx.doi.org/10.1038/nrg2825. Jeffrey T Leek et al. Capturing heterogeneity in gene expression studies by surrogate variable analysis. PLoS Genet, 3(9):e161, 2007. Jennifer Listgarten, Carl Kadie, Eric E. Schadt, and David Heck-erman. Correction for hidden confounders in the genetic analysis of gene expression. Proc Natl Acad Sci U S A, 107(38): 16465–16470, Sep 2010. doi: 10.1073/pnas.1002425107. URL http://dx.doi.org/10.1073/pnas.1002425107. Michael W Ma-honey et al. Cur matrix decompositions for improved data analysis. Proceedings of the National Academy of Sciences, 106(3): 697–702, 2009. Taizo Mori, Yukiko Iwasaki, Yoichi Seki, Masanori Iseki, Hiroko Katayama, Kazuhiko Yamamoto, Kiyoshi Takatsu, and Satoshi Takaki. Lnk/sh2b3 controls the production and function of dendritic cells and regulates the induction of ifn-é-producing t cells. The Journal of Immunology, 193(4): 1728–1736, 2014. S. Mostafavi et al. Type i interferon signaling genes in recurrent major depression: increased expression detected by whole-blood rna sequencing. Mol Psychiatry, 19(12): 1267–1274, Dec 2014. doi: 10.1038/mp.2013.161. URL http://dx.doi.org/10.1038/mp.2013.161. Sara Mostafavi, Alexis Battle, Xiaowei Zhu, Alexander E. Urban, Douglas Levinson, Stephen B. Montgomery, and Daphne Koller. Normalizing rna-sequencing data by modeling hidden covariates with prior knowledge. PLoS One, 8(7): e68141, 2013. doi: 10.1371/journal.pone.0068141. URL http://dx.doi.org/10.1371/journal.pone.0068141. Aaron M Newman, Chih Long Liu, Michael R Green, Andrew J Gentles, Weiguo Feng, Yue Xu, Chuong D Hoang, Maximilian Diehn, and Ash A Alizadeh. Robust enumeration of cell subsets from tissue expression profiles. Nature methods, 12(5): 453–457, 2015. Noa Novershtern et al. Densely interconnected transcriptional circuits control cell states in human hematopoiesis. Cell, 144(2):296–309, Jan 2011. doi: 10.1016/j.cell.2011.01.004. URL http://dx.doi.org/10.1016/j.cell.2011.01.004. Guillaume Obozinski, Laurent Jacob, et al. Group lasso with overlaps: the latent group lasso approach. arXiv preprint arXiv:1110.0413, 2011. Deborah J Smyth, Vincent Plagnol, Neil M Walker, Jason D Cooper, Kate Downes, Jennie HM Yang, Joanna MM Howson, Helen Stevens, Ross McManus, Cisca Wijmenga, et al. Shared and distinct genetic variants in type 1 diabetes and celiac disease. New England Journal of Medicine, 359(26): 2767–2777, 2008. Nathan Srebro. Learning with matrix factorizations. PhD thesis, Citeseer, 2004. Oliver Stegle, Leopold Parts, Richard Durbin, and John Winn. A bayesian framework to account for complex non-genetic factors in gene expression levels greatly increases power in eqtl studies. PLoS Comput Biol, 6(5): e1000770, May 2010. doi: 10.1371/journal.pcbi.1000770. URL http://dx.doi.org/10.1371/journal.pcbi.1000770. Aravind Subramanian, Pablo Tamayo, et al. Gene set enrichment analysis: a knowledge-based approach for interpreting genomewide expression profiles. Proc Natl Acad Sci USA, 102(43): 15545–15550, Oct 2005. doi: 10.1073/pnas.0506580102. URL http://dx.doi.org/10.1073/pnas.0506580102. Yu-Xiong Wang et al. Nonnegative matrix factorization: A comprehensive review. Knowledge and Data Engineering, IEEE Transactions on, 25(6): 1336–1353, 2013. Daniela M Witten et al. A penalized matrix decomposition, with applications to sparse principal components and canonical correlation analysis. Biostatistics, page kxp008, 2009. Hui Zou et al. Sparse principal component analysis. Journal of computational and graphical statistics, 15(2): 265–286, 2006.